Shoebox Legends: Douglas Sends the Best Soccer Player on Earth? I got my very first taste of 2017-18 O-Pee-Chee in this particular envelope. A very solid design, probably my favorite of the past few years. Had I received this card a few years back I would have probably run over to Target and grabbed a couple blasters. Nowadays I'm happy just to have the set represented in my collection with this single. 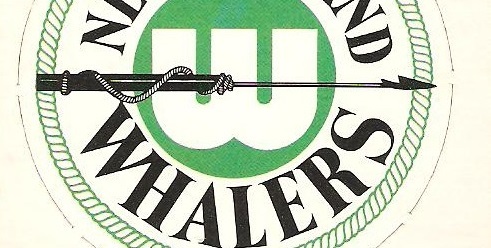 Douglas is constantly supplying me with new Hartford Whalers cards, which I truly appreciate. The latest envelope contained a pair, both from Upper Deck. First, a Robert Petrovicky from the 1992-93 Euro-Rookies insert set. 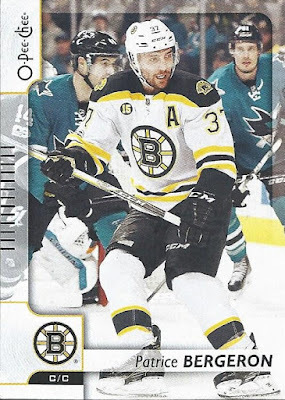 This is the only card from this set I've gotten my hands on to date, and as the lone Whaler on the checklist it's certainly the one I'd want most. The other was this great Mark Janssens Electric Ice parallel. I have some fond memories of collecting these Electric Ice parallels back in the day. 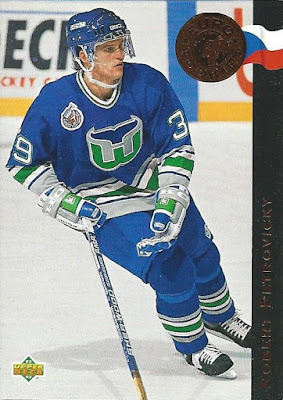 These came one-per-pack, and I think I'm probably almost halfway to a Whalers team set from this '95-96 release now. Lastly, here's the prize of the package, a card which I shamelessly claimed when Douglas posted it on his own blog a while back. 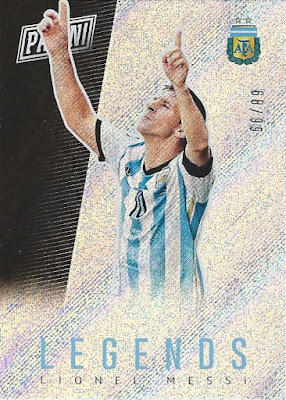 If you check in here with any frequency then you know I'm a soccer fan, and I also love shiny cards. So, this beauty from Panini of arguably the world's best player really had me drooling when Douglas posted it. He ended up sending it my way because that's the kind of guy he is. 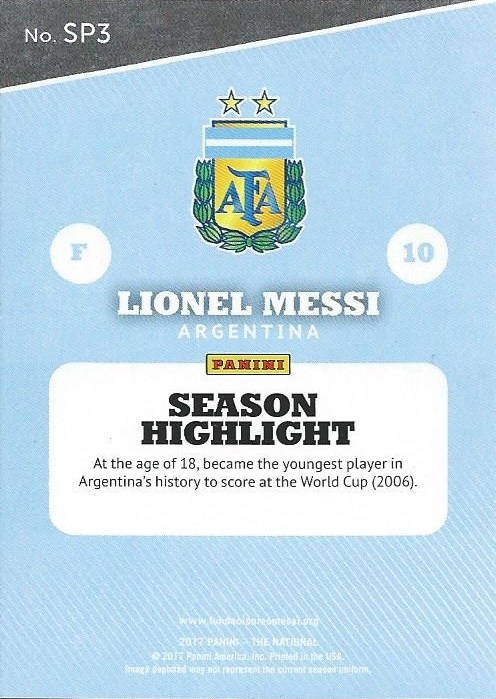 Not much to the back, which is about what I expect from Panini these days. This was at a bar in a medieval walled town called Evora, idea being you vote for the best soccer player in the world using the cork from your wine bottle. Pretty much neck and neck here between Messi and Ronaldo, which is impressive for Messi given that Ronaldo is basically a God in Portugal. Anyway, there you have it. Thanks for another great trade package Douglas! I'd be interested in hearing from any soccer fans in the comments about who they think the world's best current player is. Ronaldo? Messi? Someone else entirely? 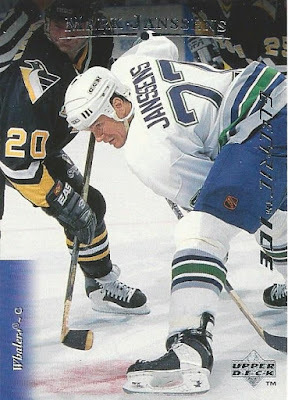 Nice cards all around, but I feel the need to say that those blue Whalers unis were just WRONG. Green all the way, baby. I have no idea who the best soccer player, er footballer in the world would be, but that's a neat way to vote for it. Nice to see Messi holding his own on Roanldo's turf.